NothingButEverything: John Singleton Kills a Pedestrian! John Singleton Kills a Pedestrian! 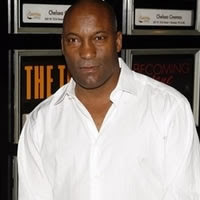 (LOS ANGELES, CA) Oscar-nominated director John Singleton was driving a Lexus SUV when it struck and killed a jaywalker who stepped in front of the car, police said Friday. Singleton, 39, immediately stopped his car and waited for police to arrive after the accident Thursday night in the city’s Jefferson Park neighborhood, said Officer Jason Lee, a police spokesman. Wow - what is going on with people this weekend?